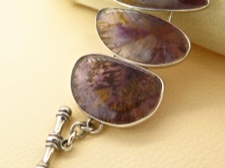 Mix shapes of clear amethyst crystals display a blend of amethyst purple and golden cacoxenite striations. Each shape has a different internal array. Set in sterling silver and connected by sterling links. 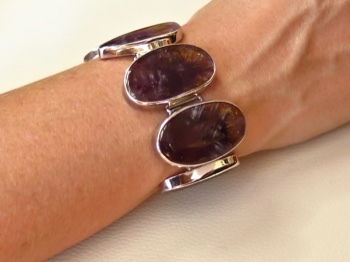 A sterling toggle allows for a choice of closures from 6 to 7.5 inches. 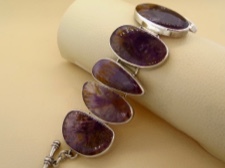 Amethyst Cacoxenite is considered rare. It was originally found in the Hrbek mines of Czech Republic, but a new vein has been freshly discovered in Brazil. 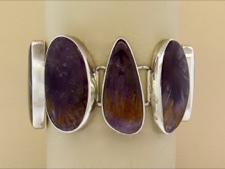 Maybe we will be seeing more of this little known but metaphysically appreciated stone.